With 2nd day of Passover coming to an end, here are some headlines our audience in the Jewish Diaspora might have missed. As always, Arutz Sheva presents news highlights from the past 24 hours for all our many readers in the Jewish Diaspora celebrating two days of chag. True, this is a very Israeli-centric story, but if you're in Israel at all during Passover, we've put together a list of sites you just have to see. Israel Air Force jets were called into action, when an unidentified aircraft from Egypt crossed into Israeli airspace. Fears were high after an Egyptian hijacked an airliner on its way to Cyprus, as well as the fatal ISIS attack on an Egyptian airliner last year. Fortunately, this incident was resolved more peacefully. An investigation and urgent manhunt have been opened after an entire family were murdered in their sleep, in what police say was a planned execution. 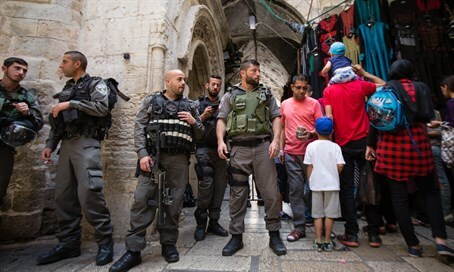 With fears of more Arab terror attacks keeping many tourists away from Jerusalem, police removed 13 Jewish visitors to the Temple Mount from the holy site, alleging they broke strict rules banning Jewish and other non-Muslim forms of worship. In a related story, Raphael Morris, leader of Return to the Mount movement, was placed under house arrest Sunday. Morris had attempted to offer the Korban Pesach (Passover Sacrifice) on the Temple Mount, but was prevented from doing so by police, who say such moves could "provoke" Muslims. Report said to include evidence of Saudi Arabian connivance in devastating September 11 terrorist attacks. Israeli archaeologists working at a dig near Haifa unearthed a beautifully-preserved ancient scarab seal, which belonged to a viceroy to a Pharaoh in Egypt some time in the 17-18th Centuries BCE. The extremely rare find has prompted a further look into the role of an ancient sea port at Tel Dor in the ancient world. Maurice Dadoun is a world-renown hairstylist who left a Beverly Hills lifestyle to come back home to Israel. Just two months after his aliyah, Dadoun decided to use his skills to help a victim of the recent Jerusalem bus bombing. Car accident, or terror attack? Police are investigating whether a deadly car crash along on Route 375 was caused by a Palestinian rock-throwing attack. An Islamist-run school in Jabel Mukaber hosted the families of several terrorists killed attacking Israelis during the recent wave of violence - including a terrorist who murdered four elderly Israelis in a gun and knife massacre aboard a Jerusalem bus. Dima al-Wawi, was jailed on February 9 when she tried to conduct a stabbing attack. She was caught by security forces with a knife in her possession on the outskirts of Karmei Tzur in Gush Etzion, Judea. Never one to miss an opportunity to attack Israel, Palestinian Authority chairman Mahmoud Abbas took aim at the Jewish state from the podium of the UN Climate Summit in New York on Friday. At the very least, he deserves some credit for consistency - and keeping a straight face. But, it's not all bad from the UN. Israeli Ambassador Danny Danon hosted the first Pesach Seder Night in New York, with dozens of other ambassadors in attendance.